The SCE-WFLP Series electrcial enclsoures are designed to house electrical and electronic controls, instruments and components. These electrical cabinets provide protection from dust, oil and water. 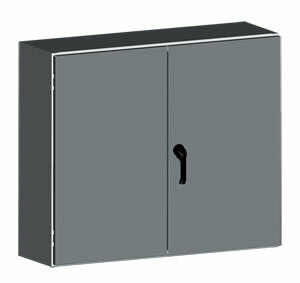 The two door electrical cabinets are available with overlapping doors or two separate doors with a center channel. The models with overlapping doors are available in carbon steel, the models with separate doors are available in carbon steel or 304 stainless steel. IEC 60529 IP 55 Note: a drip shield is required for NEMA 3R rating.